There can never be another summer like this one. We were greeted by a fading swell when we made Dive One. The rest of the summer was flat. Never had an ocean this cooperative. Will likely never again. And legs and backs tell us age is catching up to us. So we are very grateful for this last hurrah. 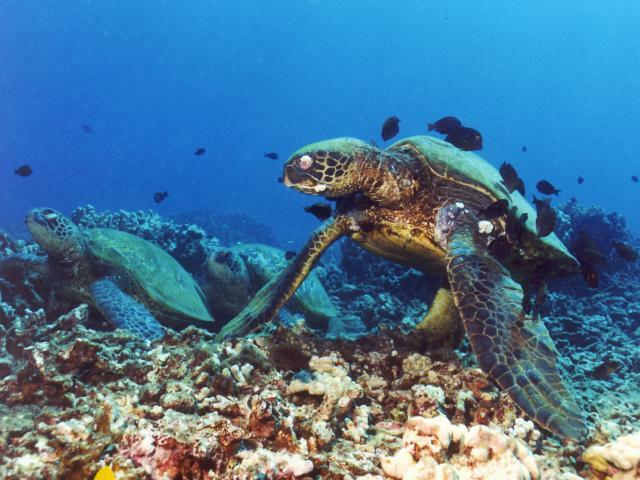 There is one dive that stands out among all the others. It was the best dive of the summer--no--of our lives. 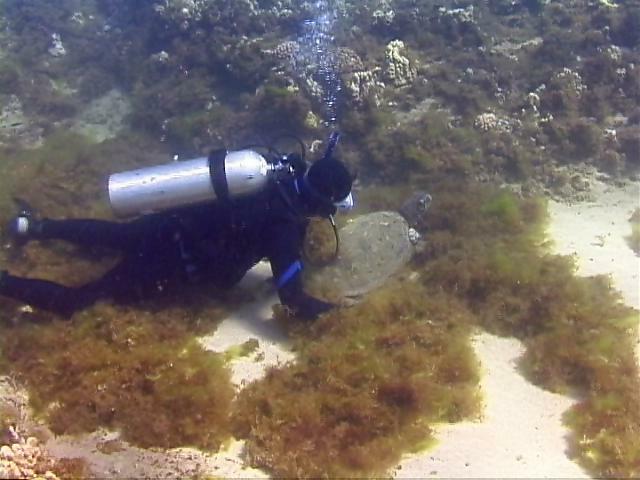 And we experienced that dive with sea turtle expert George Balazs of the U.S. National Marine Fisheries Service. 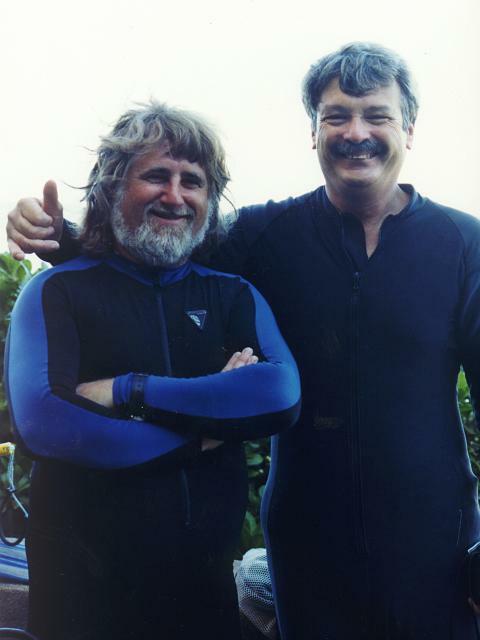 We experienced that dive with sea turtle expert George Balazs (on the right, Peter on the left) of the U.S. National Marine Fisheries Service. 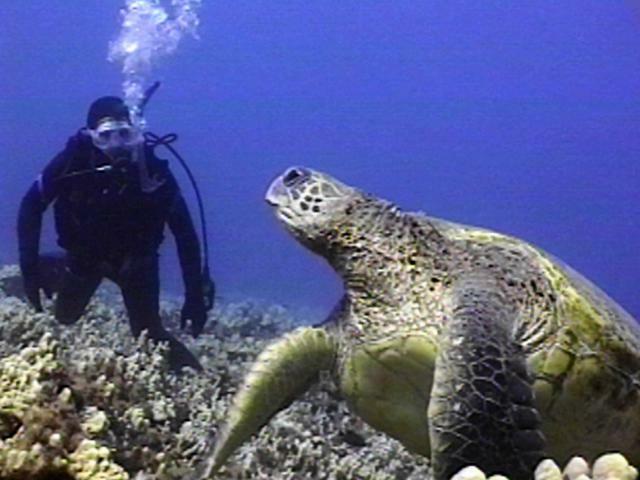 The Last Dive Aloha Day is our time to say good-bye to the honu and give thanks to the ocean for safe passage. We present orchid/carnation leis to the turtles, say our good-byes and try to drink in their beauty deeply enough to last us the ten months we'll be away from them. Often we do this through tears. 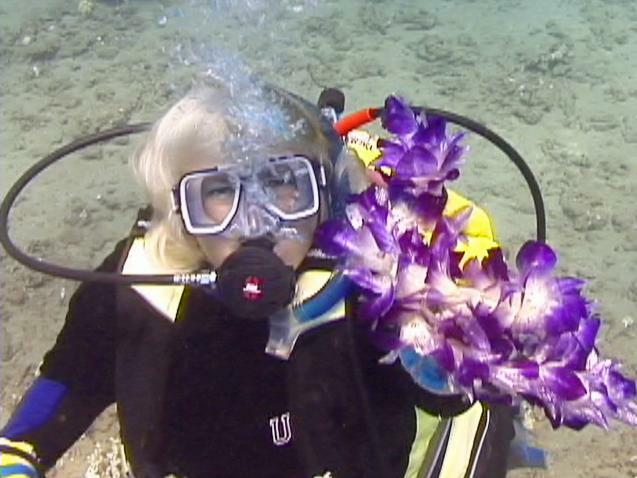 I hand Peter the orchid lei he will present to Akebono and all the youngsters of Honokowai. 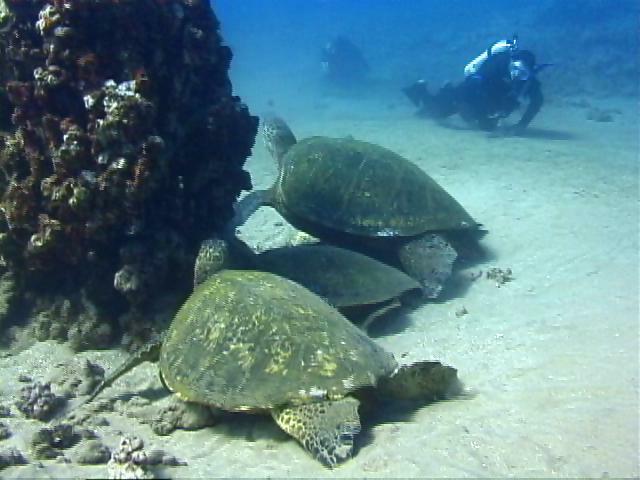 On this dive, we first went to the new area we've named North House, where George got to see three honu resting around Mt. Balazs. This is a coral outcropping that we discovered during our first full week of diving in July. At that time we named it in George's honour and placed an NMFS temperature logger there--which means it's doomed to collapse by Summer 2000. 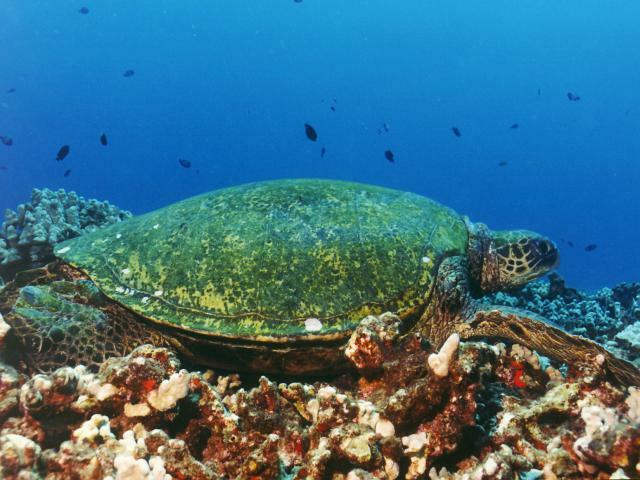 George got to see three honu resting around Mt. Balazs. Next, George finally got to meet Zeus. We've known Zeus since 1992. The turtle has progressed from not showing up at all with George around, to leaving as soon as he approaches to yesterday... letting Balazs appreciate fully how Number One Zeus really is around here. George finally got to meet Zeus. On our way back to shore, we found Polzbarney in a place we call The Graveyard. Only tumored turtles go there, and once sighted in this area we never see them the following summer. Hence the name "Graveyard." On our way back to shore, we found Polzbarney in a place we call The Graveyard. 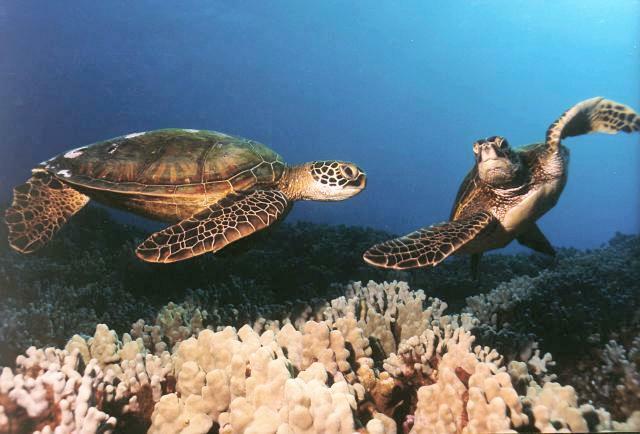 George looked closely at our friend and confirmed the young honu is "much worse" than last time they met. Our final dive of the summer was just so special, words fail so I won't even try. We're just grateful George was there to share it with us. This summer was about faces--old friends and new. And so, to wind it all up, here are some of the faces of Honokowai, Summer 1999. 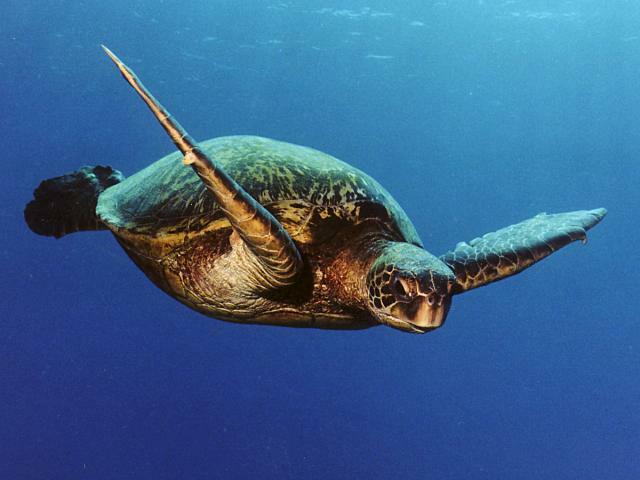 A honu "in flight", coming down from getting air. 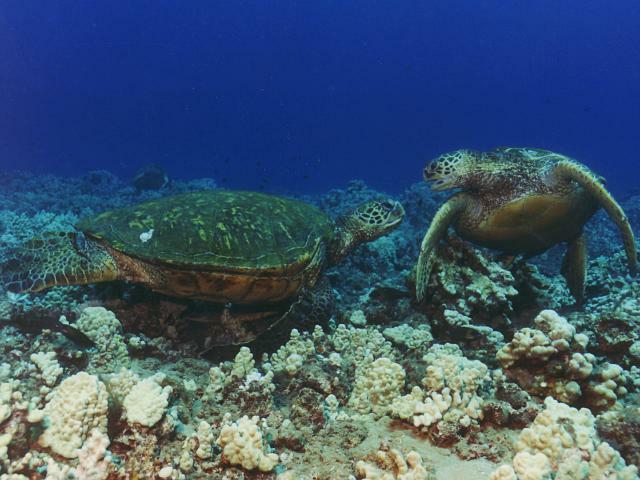 Two honu disagree over real estate. Zeus, resident since 1992, lays back and takes it easy. 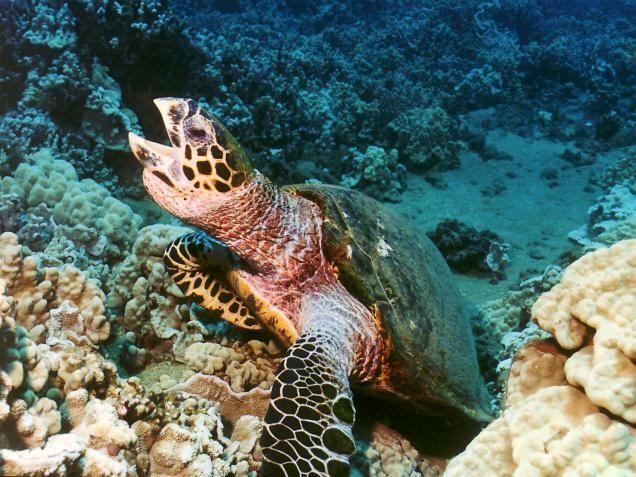 A rare visitor to Honokowai: Ake the hawksbill. 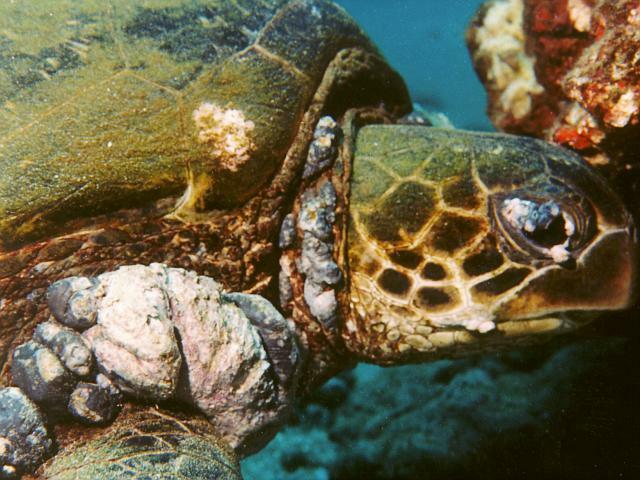 Unlike the honu, his bite is WORSE than his bark! 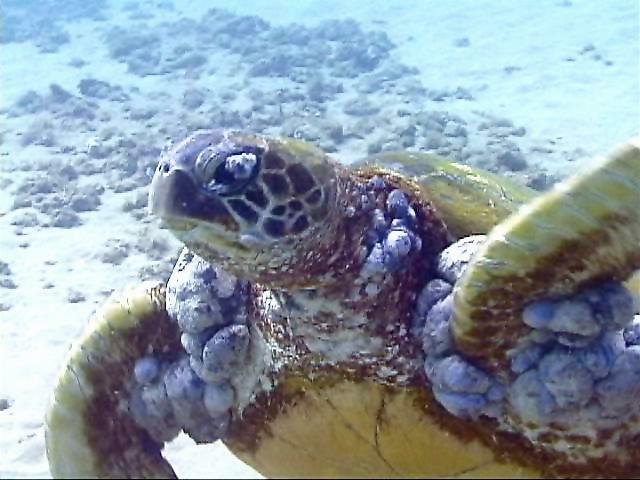 Turtle 1998#50 this summer: a fibropapilloma victim. Always, there is a spectre of disease. Makana and Akebono playing in late afternoon light. Makana is fibropapilloma's newest victim, with early signs of tumors in both eyes. Akebono, for now, remains healthy.